2016 has been an eventful year for me because I wrote my first book and continued to heal from my traumatic divorce like a rock star. In March 2017, my book will be released and more healing will occur which I am dually grateful for and excited about. Recently, I was at one of my Zumba classes, and a song came on that brought me back to the good old 80’s and inspired me to write this blog. The song was Man In The Mirror by Michael Jackson and in it, he is sending the message that in order to make a change in this world you need to look at yourself first and take a look in the mirror. We are living in a world where we tend to play the blame game over and over again and are so afraid of taking any responsibility for our own actions. Not only does this get you to nowhere land but it stunts your personal growth and development big time. In order to move forward in life and learn from our mistakes, we need to stop complaining and depending on other people to make changes for us. We need to take a look in the mirror at ourselves and make the changes from within that we want to see because that’s where it all begins. Imagine if only half of the world’s population could do this and how much fighting could end and how much peace could be gained. It’s easy to turn a blind eye to what’s happening to people less fortunate than us and so much more work to look within ourselves, but in the end, it’s also more rewarding long-term to be your own mirror. Another song that ties in with this one is also by Michael Jackson and it’s called Heal The World. This is a cry for help for those in need and since it’s the Christmas season, what better time to do this. Everyone has their issues and situations they’re dealing with and healing from, and all it takes is a little compassion and an open heart to help someone thrive. Even though we might live in different countries around the world, we are still connected and want the same things out of life which are love, connection, and peace. If we could only realize we’re all in this life together, we could really heal the world and make it a better place for you and for me and the entire human race. My best wishes and love to each and every one of you in 2017 and thank you so much for your support all this time, I am extremely grateful for YOU. I have recently been nominated for another 3 quote 3 day challenge by one of my new friends and followers Gursimran Kaur and her blog titled Rum n Raisins http://gursimrankaur16.com/ Just the name of her blog makes me think of rum raisin ice cream which makes me hungry! 🙂 Gursimran is a young aspiring blogger who wants to work for peace, become the most amazing lawyer, travel the world, follow her bliss and live her dream! She is truly an inspiration, please feel free to check out her blog and follow her. I am a huge quote person so this challenge is more about narrowing my thousands of choices down to three per day! For today, I will be sharing quotes by Rumi who is an inspiration to me. So here we go. 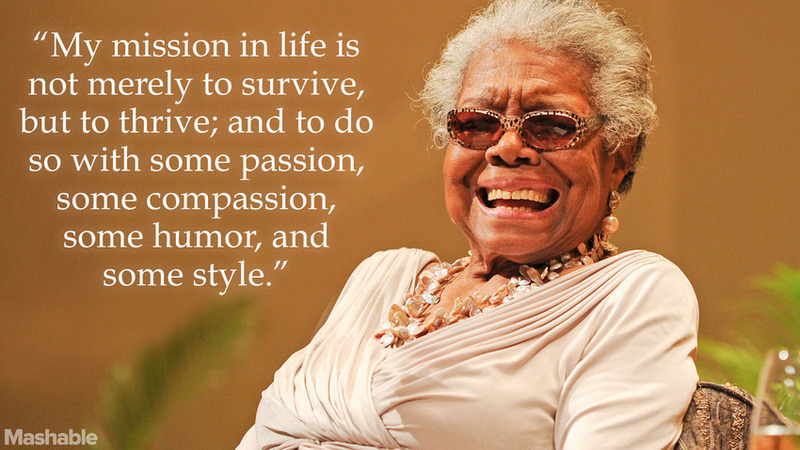 Maya Angelou is a true compassionate woman with an outstanding sense of humor. Her quotes are so real and honest you always know where you stand with her. I have to say I do miss her and her funky glasses, her wise slow talking grandmotherly voice, her interviews with Oprah Winfrey, and her punchy lines that can shock and inspire all at the same time. 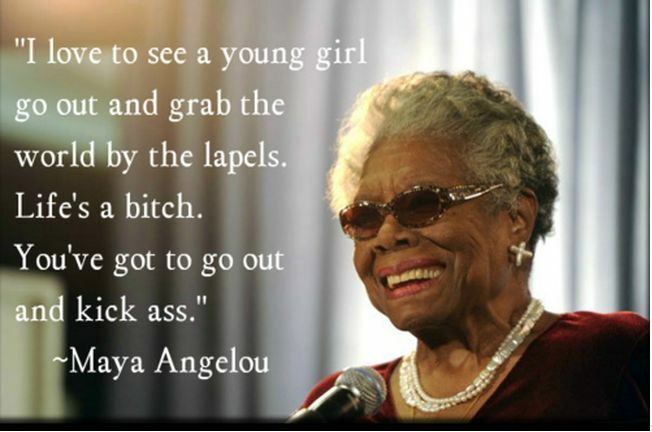 I’m so grateful there are many quotes of hers widely available to all of us and today I just thought it would be nice to list some for all of you. Here’s to you Maya, with love. .. Missing you Maya, you’re awesome! Inspiration can be found in so many corners of our lives and one of my favorite places that really touched my heart was on the television show Life Story Project. The show was aired on “OWN: The Oprah Winfrey Network” and then unfortunately was cancelled due to network issues. Andrea Syrtash and Dale Curd were the two hosts on Life Story Project and when I saw it was discontinued last year, I decided to write to Andrea to express my love for the show and for her compassionate way of exploring and questioning people’s hearts and lives on the streets of Toronto, Ontario, Canada about real life topics. Andrea quickly responded to me and we connected instantly bringing us to a new found friendship where inspiration and support continues to live on. Life Story Project is about people’s stories and how connection, courage and vulnerability bring us inspiration and promotes personal growth and development within ourselves. This 4 minute sizzle reel video clip of Life Story Project perfectly describes what the show was all about and I cannot describe it any better than Andrea and Dale. It’s actually something to be felt. After watching the video, please read the interview I was able to have with Andrea where we dig deeper into the details of the show and how inspiration touched her heart and life as well. All of my gratitude to Andrea and everyone from Life Story Project for inspiring my life because in essence, we are all living our own life story project the very best we can. We are all connected, therefore never alone. Not only is this a catchy, punchy title for a book, it makes a lot of sense…once you read it. For some this may trigger some laughter and for others they might find it offensive at first glance. Personally, I found it funny and real. Little did I know it was going to wake me up to something bigger and better. I was at a conference last year when I came across this book and after reading the description on the back cover and browsing through the table of contents, people around me started to ask me questions and we joked about the title. Even when I bought the book, the volunteers working the table asked me to read it and come back to give them a report on it! This was a big conversation piece and I could hardly wait to dive in and read it. 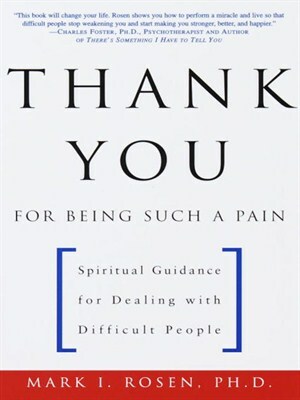 As it reads on the back cover, “With wisdom and humor, Thank You For Being Such A Pain offers gentle and compassionate guidance for understanding and healing relationships with difficult people. The author Mark I. Rosen, Ph.D., reminds us that nothing in your life happens randomly and your pain has a deeper purpose; frustration and pain are as necessary for your personal and spiritual growth as love and joy; transforming enmity and completing unfinished business may be the most important skills you can learn in life; and when you make an effort to work on your inner self, your outer relationships will be transformed.” The bottom line is that after reading this book, it can change the way you see the difficult people in your life as well as the way you see yourself. The silver lining awakening is that over time, you will be able to thank the difficult person for what they said or did to you because it helped you learn something about yourself and it made you grow into a better human being. Your higher self. Everyone can relate to this book because there are difficult people everywhere we go and there have been times where we are the difficult person. (I know, harsh but true…). We can’t always point the finger at someone else, it’s important to take some responsibility for our own actions and how we may have contributed to the situation. After all, nobody’s perfect. I really love how the author explains the emotional and spiritual side of understanding the difficulties, options for dealing with difficult people, why people are difficult, healing the difficulties, embracing the adversary and relating to difficult people overall. I would like to share a powerful exercise from the book that I recently found to be helpful in my own life after being heart broken and it’s called Three Healing Letters. The purpose of this exercise is to use writing as an outlet for emotional release, most commonly anger and sadness. For all the writers out there, just remember do not send, post, give these letters to the difficult person! This exercise is just for you and your heart. With pen in hand or computer in front of you, write a letter to the difficult person. Feel free to say whatever is on your mind and in your heart, don’t hold anything back. How were you hurt? What was taken away from you? How has your life been affected? What do you think of the person? Take your time when you write and there is no deadline so add to it as needed over how many days, weeks, months it takes. Pay attention to how you feel in your body, what physical sensations are happening as you write? These are your emotions being released, be kind to yourself. Keep writing. When you no longer feel the intensity of emotions inside you as you write and read the letter out loud, the letter is finished. Resist the temptation to mail it! Now you can write the fantasy reply you would love to receive to letter 1. Take a different position by writing as if you were the difficult person. What do you want to hear? What would you like the person to say to you that would ease the pain and make you feel better? What type of apology would provide some closure for you? What would you like to be acknowledged? 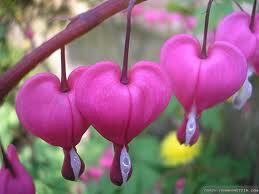 Continue to pay attention to your physical reactions as you write, cry it all out if you feel like it. Even though you may never receive a letter like this it will feel good to express it. As strange as it may sound, write the difficult person a thank-you letter. Thank them for all the positive things they did for you in your relationship despite the wedge that sits between you now. What might be the blessing in disguise here for you? 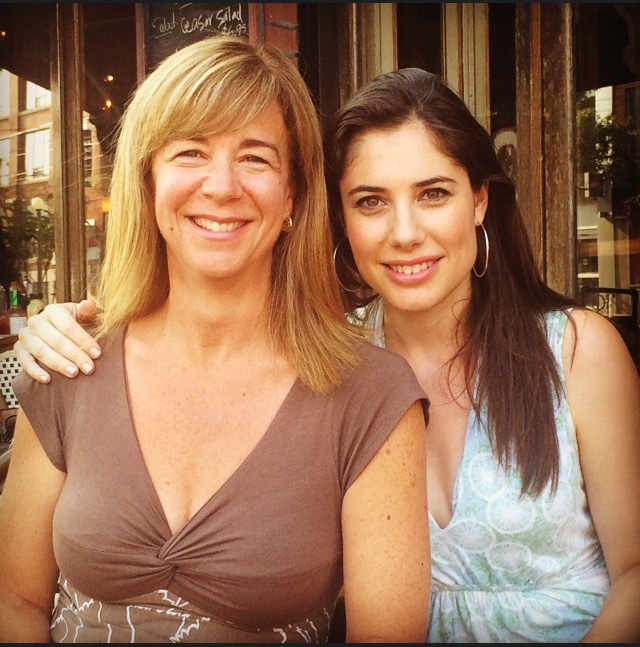 Thank the person for teaching you valuable life lessons that you wouldn’t have normally seen if it wasn’t for them. Not only did they teach you about patience and compassion but also about sharpening your relationship skills for future use with others. You may even want to thank them for not seeing the real you because now you are free to find someone who truly appreciates you for who you really are. If you are having trouble finding anything positive or unable to say thank you, then your anger hasn’t been fully vented or dealt with yet. Please know this is okay and that you need to spend more time on letters 1 and 2 while reminding yourself there is no deadline. Time is your friend. When you have completed letter 3, you are finally able to forgive, let go and surrender. You have healed from within because love replaced fear and gratitude shifted your perspective. Burn the letters, shred them or even bury them in the sand and have them washed away for good. Do something profound to mark the occasion of putting the past behind you where it belongs. You are light and free. Now you can say “thank you for being such a pain” with compassion for yourself…and mean it. I would like to apologize for not blogging these past two months. Life got busy! However, I’m back and happy to be here again. I recently attended the 4th Annual Compassion Fatigue Conference in Kingston, Ontario put on by Francoise Mathieu who is the Owner and Director of Compassion Fatigue Solutions which is an excellent resource for helping professionals. This year, I was a panel speaker at this conference in early June and it was a privilege to be involved in discussing how coaches and nurses who work in Fertility can unexpectedly cross the invisible line from being compassionate into compassion fatigue if we are not careful. Infertility patients can ride an emotional roller coaster which is completely understandable due to what they have to go through and sometimes without realizing it, helping professionals can find themselves sitting right next to them on that same roller coaster, hoping for the best and fearing their outcomes which can have serious personal and professional drawbacks which in turn does not benefit the patient. As helping professionals, we need to adopt the same theory as on the airplane, “Put your oxygen mask on first, caring for others requires taking care of yourself first.” I believe this so much that it is inscribed on the back of all of my business cards as a reminder to others and also for myself. The goal for helping professionals is to give excellent quality care to our patients and to do that, we have to remember to take care of ourselves along the way because we count too. This way, everyone benefits. I look forward to hearing your thoughts and comments. Thank you! CALLING ALL NURSES: HOW MUCH OXYGEN IS LEFT IN YOUR TANK? Have you ever been on an airplane and really paid attention to the flight attendant that is acting out the proper way to put on your oxygen mask in case of an emergency? I am guessing the answer to that is “no.” I have a challenge for you the next time you find yourself on a flight to paradise. One of the reasons the flight attendant is demonstrating this necessary policy is because in order to help other people, you have to start with yourself first. The same is true when you apply that to your career as a nurse. We are not only taught but expected to take care of the patients, their families, and our colleagues, only to find out later that we forgot to take care of ourselves along the way too. This is a normal consequence of doing a good job for others but not for us. Is it possible to think that we count too? Or is that just being selfish? If we don’t put our oxygen mask on first, where does that leave us? On the plane with the others heading for a crash landing in a town called BURNOUT. The best way to avoid stress and burnout as a nurse is to start by putting your oxygen mask on first so that you have enough to give to others. Also, you can only give what’s in your tank so it’s important to monitor this amount that you have at all times. You do realize I am using a metaphor here and that the oxygen mask is an analogy for taking care of yourself, right? Stress and burnout are rapidly increasing all over the world in every helping profession out there. In schools, burnout is not even talked about which is sad. Nurses are often overlooked for all the hard work they do and at the end of the day, we are expected to take care of our families at home and friends in need. All of this is possible, as long as we take care of ourselves and don’t run our bodies on empty. When our oxygen tank is no longer in the green and is heading straight for the red, it’s time to jump into self-compassion mode! What is self-compassion anyway? Self-compassion involves 3 key components that can ease our stress by far. (Neff, 2003) Start by treating yourself kindly like the way you would treat a good friend who is suffering rather than using harsh judgment on yourself. Two, try to see your own experience as part of a larger human experience instead of isolated and abnormal. We are not perfect and neither is life. Third, become aware of what you are feeling emotionally and let them be as they are instead of suppressing them for a later date. On a physiological side which is a great side for nurses to understand, when we are being self-compassionate to ourselves it releases the “feel good” hormones of oxytocin and opiates. Similarly, if we are self-critical when we have a bad day, it threatens our defense system and cortisol and adrenaline are released into the bloodstream making us feel even worse. We become irritable, tired and stressed. Do you see the road sign that is up ahead? Burnout. Unless you make a change soon, that is where you will end up. So how do you change? Practice the 3 key components of self-compassion and give yourself a time out or a break. 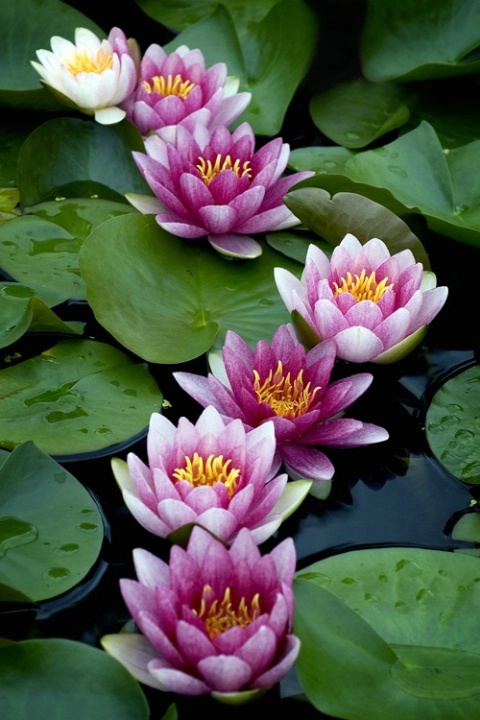 When you are able to do this, several things will begin to occur such as a greater desire to learn and grow, higher motivation, less frustrations, increases in life satisfaction, connectedness, gratitude, more effective coping skills, more caring and supportive relationship behaviour, more conscientiousness and improved health and wellness.